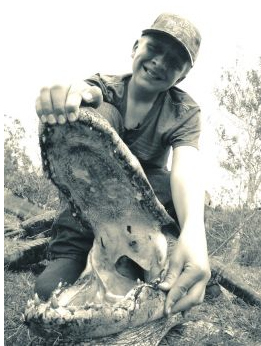 I wanted to share a hunt I took last month with an awesome, 13-year-old young man named Wyatt Enman from Utah. Below are some pictures from our Outdoor Dream Foundation hunt that took place March of 2013 in Florida. We went alligator hunting in Avon Park Air Force Range. It’s a 106,000-acre military training facility located in Polk and Highlands counties in south central Florida. The facility provides hunting and fishing opportunities to the public and military personnel. Kurt Olsen, supervisor of forest management and outdoor recreation for Avon Park, managed the hunt. Doc Crews and his family offered up their services for a turkey and hog hunt, a place to stay and so much more. We had an awesome time! Wyatt has a disease called Neurofibromatosis usually referred to as NF1. He suffers from tumors on his spine, tailbone and brain and the likeliness of him getting better is not so. This is a terminal disease. 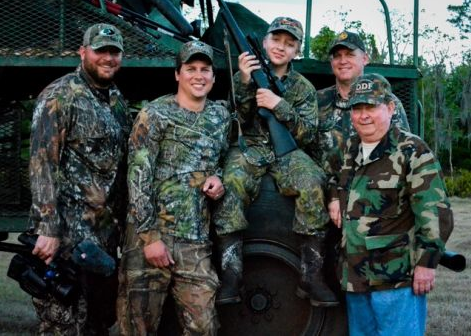 The author (second from L) is joined by Wyatt and others who helped make his hunt memorable. Wyatt had a lot of fun on our Florida hunt. 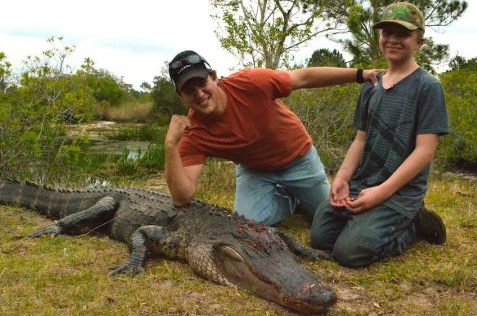 We hunted turkeys and hogs along with the alligator he harvested. He has a great attitude. We joked around and played pranks with everybody in camp. He never complained or played with his phone. He was ready to go hunting every morning at 5:30 a.m. with a smile on his face and all of his gear in tact! He likes to cage fight with his big brother and his new passion is hunting. He loves dogs of all kinds and he spends a lot of time with his nephew Gauge. Wyatt is a great kid with an unfortunate disease. I say a prayer for him daily to experience life to its fullest. It was a real honor to hunt with Wyatt. I’ll never forget that look on his face when he heard his first turkey gobble and especially the look he had on his face when that alligator exploded out of the water and headed right at us. The author and Wyatt checking out his gator! A special thanks to everyone who helped with the hunt. Brandon who ran the camera, Henry Barnett, South Carolina game officer and just a great guy who volunteered his time and efforts for the trip, Doc Crews and the entire Crews family for the great hospitality, everyone at Avon Park Air Force Range, Outdoor Dream Foundation and “Hank Parker 3D” sponsors. You all are awesome and we cannot do what we do without your help. Look for this hunt to air during our 2013 TV season on Hank Parker 3D. Life is short. Enough said. This entry was posted on Sunday, April 14th, 2013 at 9:16 pm	and tagged with Catfish Parker, Hank Parker 3D, Hank Parker Jr., Outdoor Dream Foundation, Outdoors and posted in 2013, General Tales. You can follow any responses to this entry through the RSS 2.0 feed.